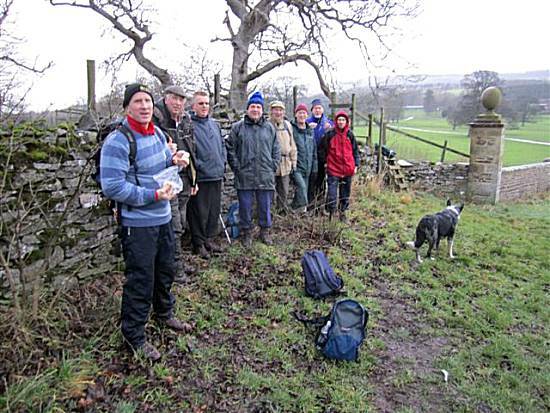 A very depleted group of walkers arrived promptly at the Pateley Bridge car park in time to enjoy Ron's excellent Bacon & Sausage butties. 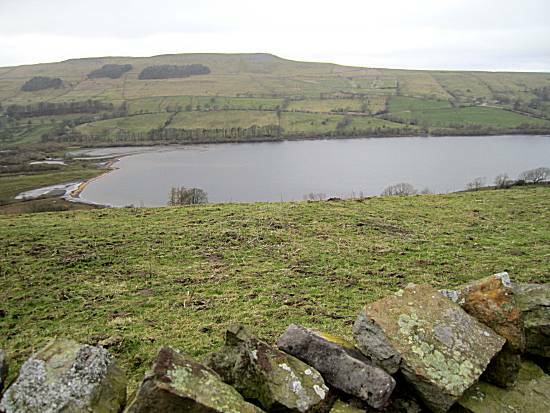 They were able to set off at 8-35 at a good pace quickly arriving at the giant Gouthwaite Reservoir dam and, without resting, continuing onward to the start of the steep climb, near Ramsgill. Without pausing the walkers reached the top to start the long track upwards towards the infamous shooting lodge, whilst listening to many guns at a nearby shoot. 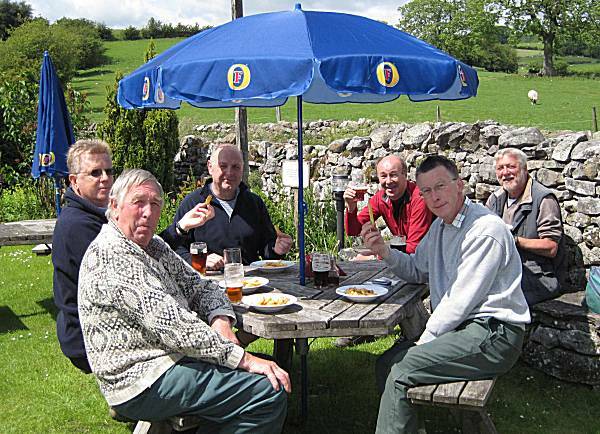 The walkers were pleased to find the rear door of the shooting lodge open and were able to share much of their pork pie rations, together with a mars bar crispies in comfort. 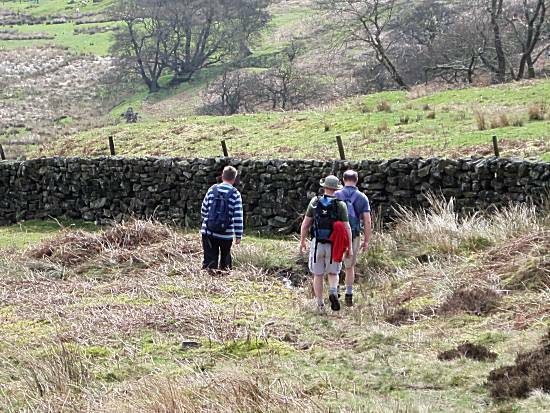 The walkers continued down the very steep bank before starting the climb toward their planned lunchtime stop at Middlesmoor. The walkers stopped only for a group photo having completed the majority of the first section of the walk in a record time. 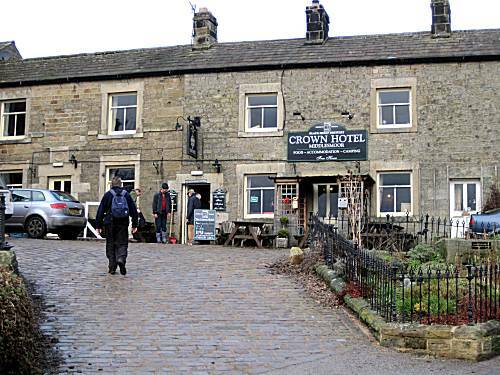 The walkers were very pleased to reach their lunchtime stop in the Crown Hotel in Middlesmoor, where, except Ron, much Black Sheep and Ale was consumed. Arrival back at the cars at Pateley Bridge signalled completion of their long walk. Departure was swift in an attempt to get Sean back for a dinner date that evening at 6pm. 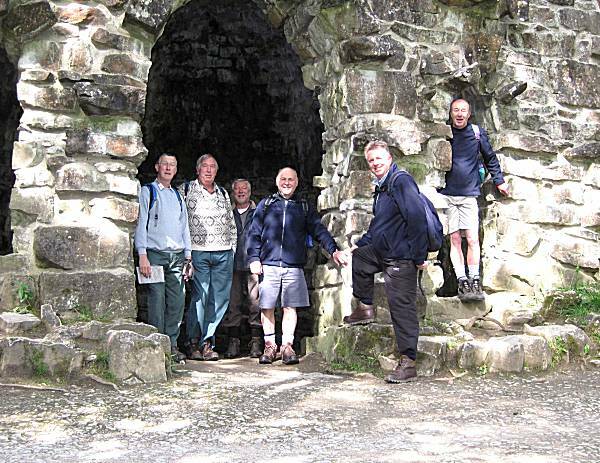 All the walkers agreed that the exertion of such a long and difficult walk was worthwhile and agreed to meet again in February for another test of their skills. Weather: Dull and cold for most of the walk. Hard underfoot in the morning, but somewhat muddy in the afternoon. 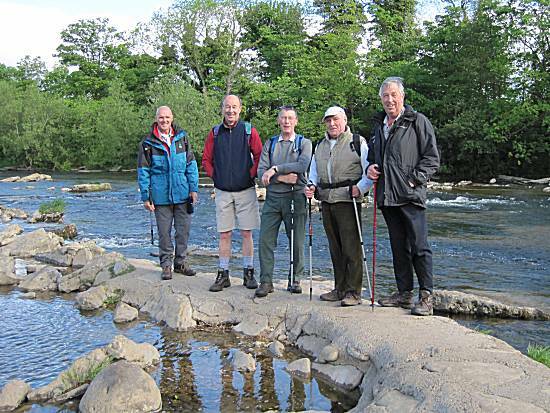 The five brave walkers met up at 8.30am at Wath Bridge, on the River Ure, close to Aysgarth in Wensleydale. 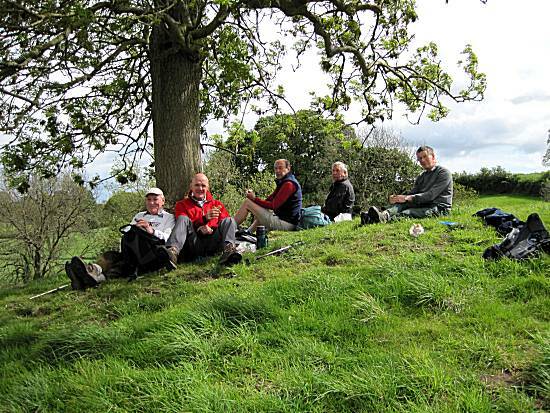 They enjoyed Ron’s bacon and sausage butties, delicious as usual, before promptly setting off for the day’s walking. The route took them, for the first part, on an unexplored green lane route not walked by the group before, up onto Stake Fell near to the dominant Addlebrough Hill, which was lost in the morning’s mist. They observed some other fellows on the misty hillside with dogs and we presume ferrets, trapping rabbits at a warren. Crossing the moor, for quite a while on good paths, they eventually joined a familiar track, Stake Road, heading down towards Semer Water. 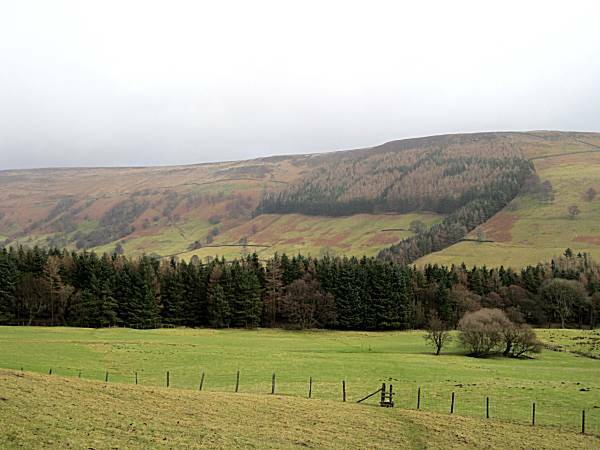 The walkers can be seen in good spirit, having left the moor, with the mist clearing permitting good views across Raydale, as they headed down hill towards Semer Water. After passing Semer Water they continued alongside England’s shortest river, the River Bain, towards Bainbridge, alas a short climb up to and over Bracken Hill was on their route, but this allowed them an excellent view back along the River Bain with Semer Water in the distance. They passed through Bainbridge, disturbingly for all, passing an open pub on their way to the village of Askrigg a mile or so away for their lunch time stop. 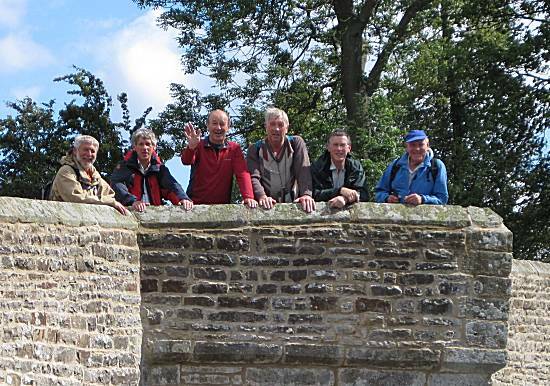 The tired group (missing Alan’s energy promoting mars bar crispies) were relieved to arrive at Askrigg at the late hour of 1.45pm, after a long morning’s walk of just over 13 miles. 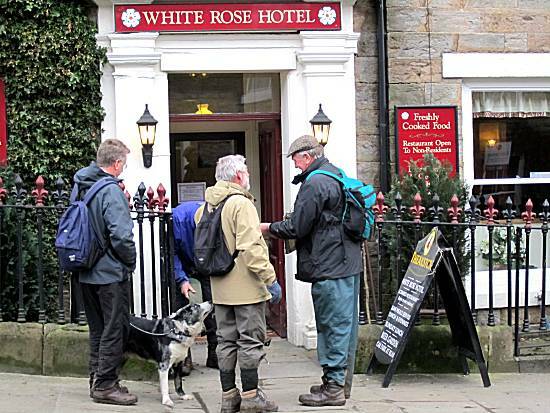 They were welcomed by the very chatty landlady at The White Rose Hotel. 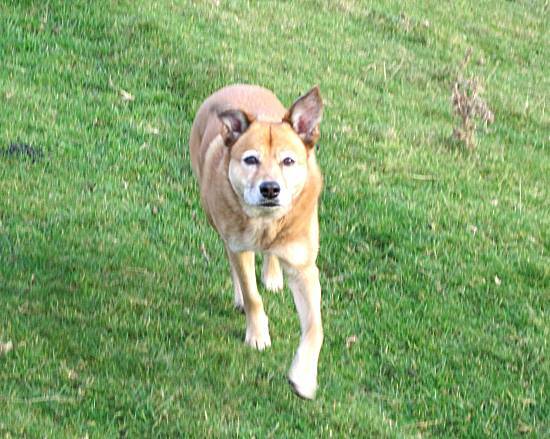 The landlady advised of a gent (no longer with us) who had the name “Romeo” for his walking group. 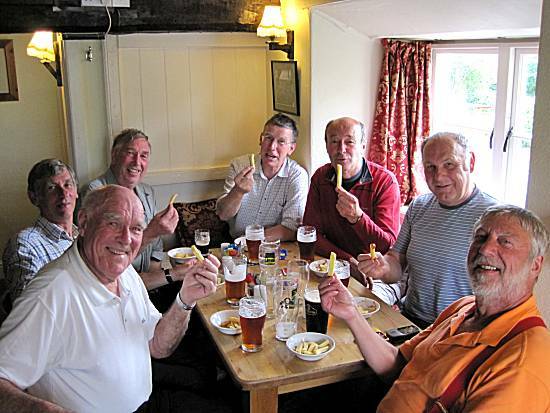 This stood for “Randy Old Men Eating Out” and prompted our group to think that it’s time we had a similar name to call ourselves – suggestions in a plain envelop please! An excellent local brew was served, Askrigg Ale, which was enjoyed together with portions of particularly good chips, reasonably priced too. They agreed these chips were amongst the best encountered to date. After a welcome rest and refreshments, they headed off at 3.30pm. The last leg back to the cars was around three miles or so, along side the track bed of the dismantled railway running through the dale. A brief stop was made en-route to finish off Andy’s pork pies, before arriving back at the cars at 5pm. A very unwelcome sight greeted Tom, a flat front tyre on his car. Fortuitously and well planned, Tom had a 12v tyre pump in his boot, which inflated the offending tyre gradually. The problem was a leaking valve, so once inflated and dust cap screwed firmly on, Tom headed off, at rally style speeds, hoping to get home before it went flat again, with Neil and Ron in hot pursuit trying to keep up, just in case it deflated prematurely. The tyre thankfully stayed up. An eventful end to a good day’s walking. Weather: Cloudy and chilly all day, the morning mist clearing by noon. 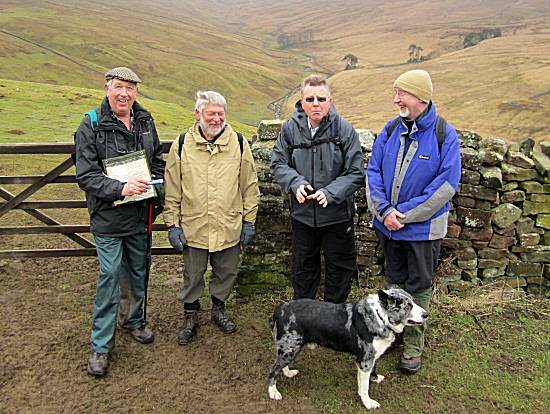 Walkers: Cliff, Andy, Ron, Neil and Tom with Moss the dog. 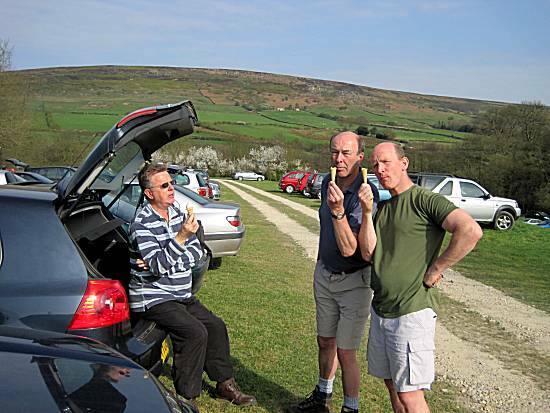 Four eager walkers arrived at the deserted car park in Low Mill around 8-30, quickly devouring Ron's excellent hot Sausage and Bacon butties, before setting off to attempt a dangerous journey to locate wild daffodils in Farndale. 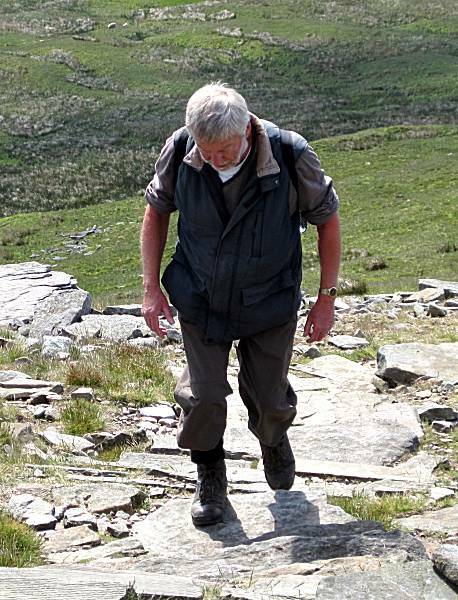 To avoid the previous tortuous route up to the track at the top of Rudland Rigg and under expert Neil's guidance, an alternative route was tested, which although steep proved most successful. At the top the long stony track towards the dalehead, was difficult underfoot, but caused the walkers little concern as they made good time in warm, but slightly cloudy conditions. 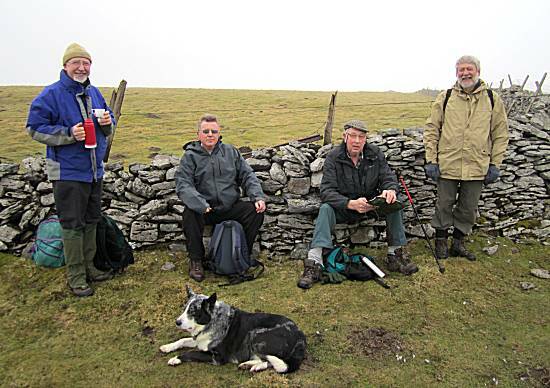 The walkers rested by a gate, before stopping for their 11 o-clock break, where they shared half Sean's excellent pork pie and Alan's mars bar crispies, still wondering whether they would find any daffodils. 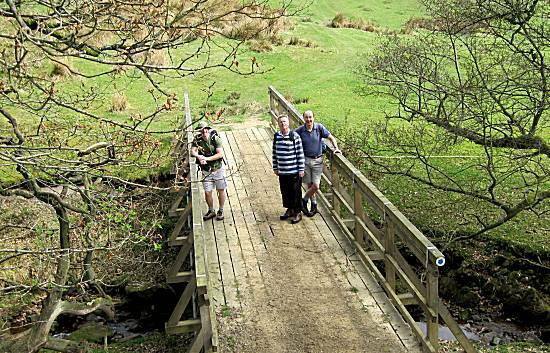 The strong timber bridge proved irresistible to the walkers who characteristically gathered for a group photo in the now bright sunshine. As the walkers rounded a corner they were overjoyed to see the Faversham Arms in Church Houses. This had been reached in an incredible time and they skipped down the hill to take on necessary fluids. Much refreshing Black Sheep and Copper Dragon ale was enjoyed in the busy pub garden, together with two bowls of excellent chips. 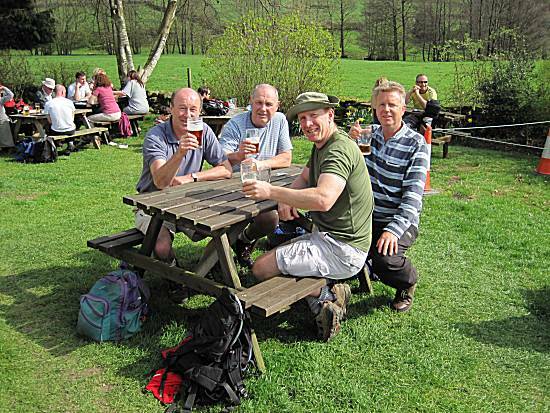 As Alan calculated only a short walk back to the cars, the walkers decided to stay for extra energy releasing ale, before setting off back to Low Mill. But they were still aware that no daffodils had been found. Would their mission fail? 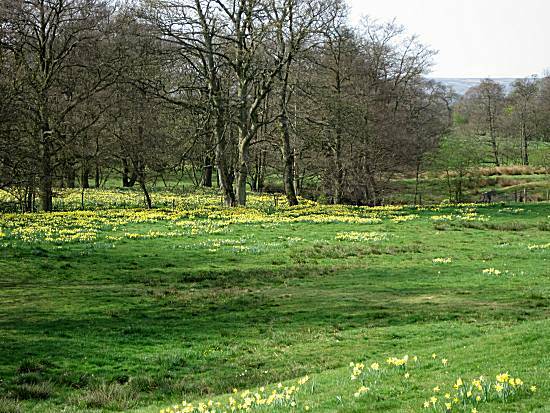 The walkers stopped for a picnic on their way back to the cars, finishing all their pork pie and mars bar crispies supplies and revelling in their success at finding so many daffodils. In celebration of another excellent and successful walk in bright sunshine, the walkers awarded themselves special dairy ice creams (vanilla flavour), before departing to their homes in jubilant mood. Weather: Warm slight cloudy early in the morning turning into an excellent hot sunny day. Walkers: Sean, Alan, Ron & Neil. The walkers were not scared by the strange creatures seen as they followed the difficult path generally following the route of the river. 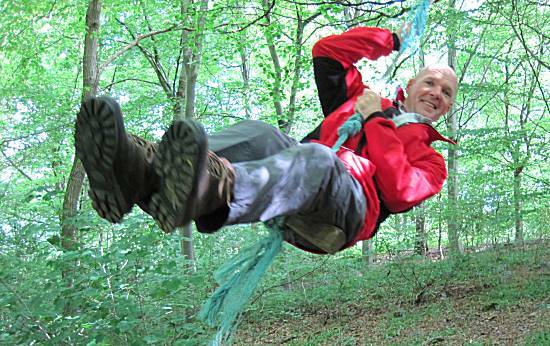 However, even under Neil's expert leadership the elusive Hackfall Woods still failed to materialise. 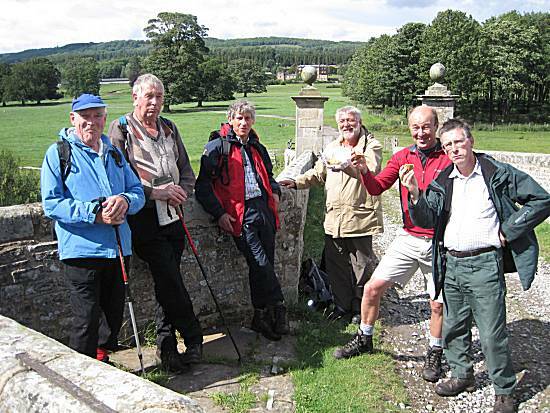 The walkers were impressed that the landowners had provided them with an excellent building to enjoy their pork pie and mars bar crispies rations. 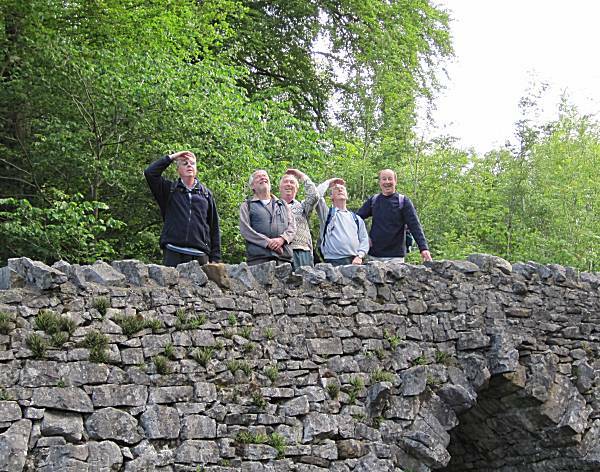 The walkers gathered in the view of a giant waterfall, whilst Mark took much effort to frame the notable event. The walkers succeeded in their quest to reach the ruin at the very top of the hill, where they rested, marvelling at the view. 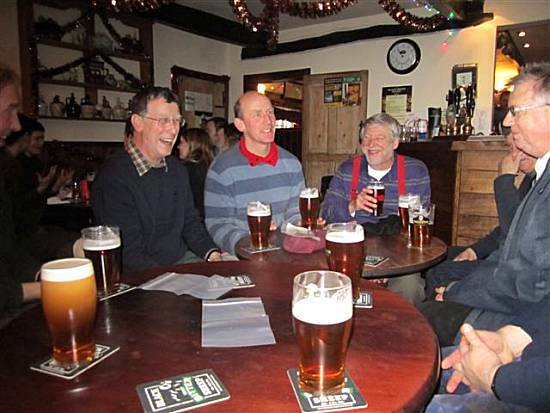 The walkers enjoyed much Jennings "Tom Fool" and "Ringwood Ale", during their visit to the Crown Inn at Grewelthorpe. Small portions of chips completed their lunchtime experience. The walkers completed their mission in high spirit, overjoyed that the threatened rain during the day had not materialised. They left after agreeing to meet again for more walking adventures in mid June. Weather: A sunny day, but wind made it seem much cooler. 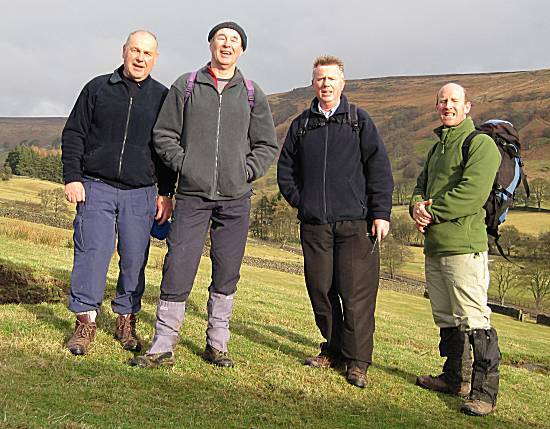 Walkers: Neil (Leader), Cliff, Paul, Mark, Brad and Alan. Distance: Not as long as previous walks, but with a huge amount of climbing!! 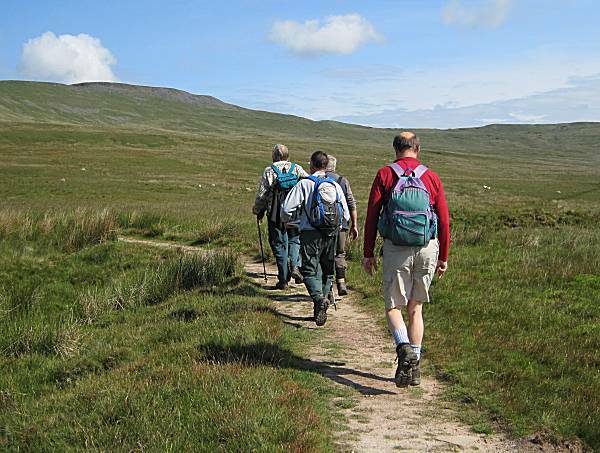 The walkers arrived early in Clapham parking alongside the river, eager to consume Cliff's bacon butties, before setting off towards the infamous Ingleborough to attempt to reach the summit at 2,372 ft. The excitement can be seen on the walkers faces as they proudly posed near the giant waterfall they discovered shortly after setting off. 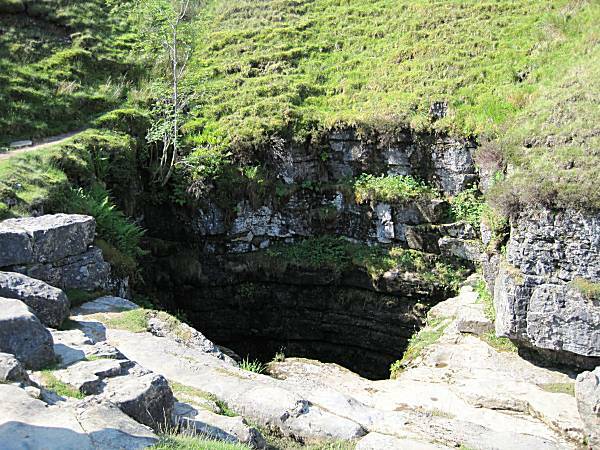 The walkers stood in amazement peering down the giant and deserted "Gapping Gill" pot hole. 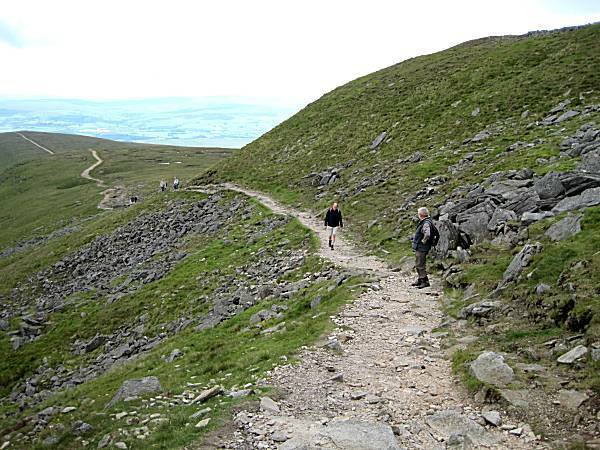 As there were no volunteers to investigate it further, they continued on their route upwards toward the summit of Ingleborough, which now dominated the skyline. Although the long ascent started gently, it continued relentlessly, becoming steeper with every step. With great efficiency, the walkers were ferried back to the starting point, courtesy of Susan (Paul's Wife), after what was agreed was a short, but challenging walk. Weather: A sunny day, but quite windy on the exposed mountain tops. 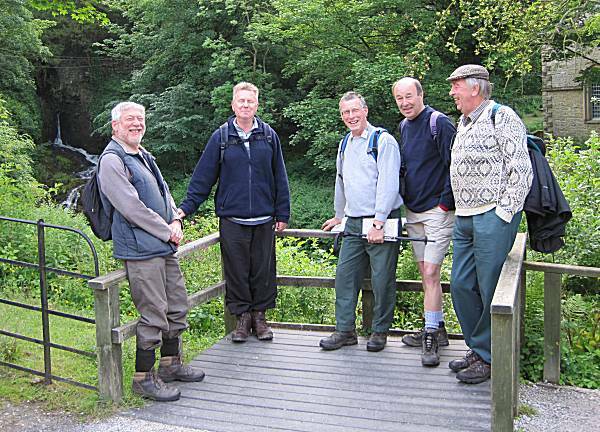 Walkers: Paul (Leader), Neil, Ron, Cliff, Andy and Alan. The walkers arrived in the layby just short of the big house at Swinithwaite, eager to consume Cliff bacon & egg butties. Although it was not raining when they set off, the forecast was terrible and it was not long before the rain, that they would be walking in for most of the day, arrived. 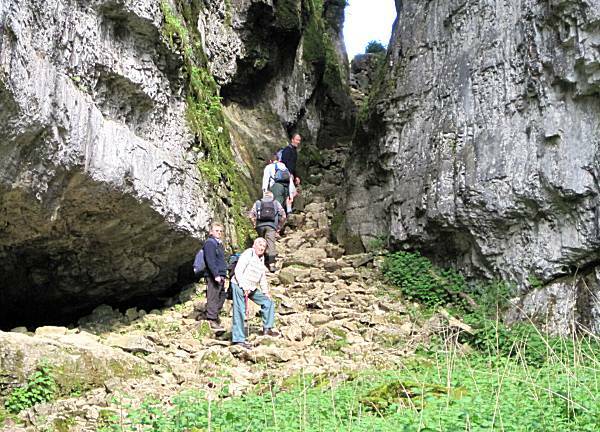 The route took them up to the south of Swinithwaite heading along the familiar route to the waterfall at West Burton. 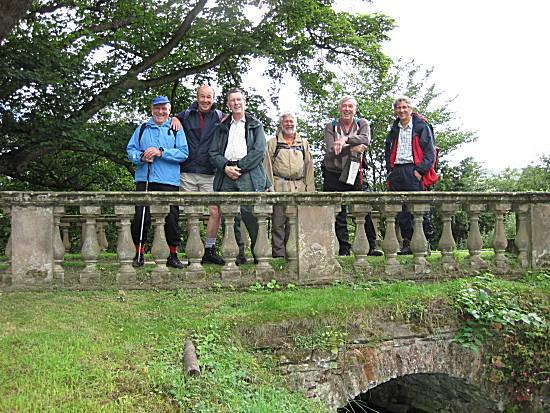 The walkers were disappointed at being unable to locate a bridge for their group photo early in the walk, but cunningly located a stone bridge over a stream, which lifted their spirits amazingly. 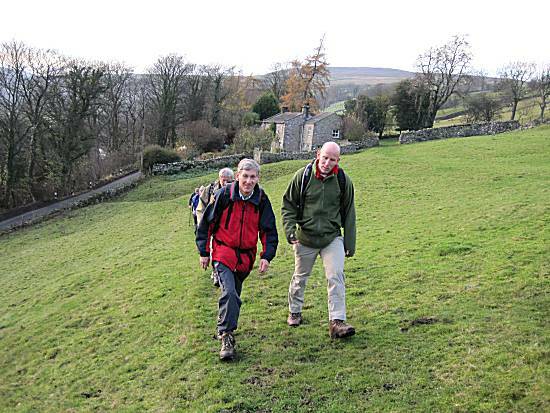 The route continued onward with views over Thoralby until, on arriving at Aysgarth, they sheltered in the large church porch, whilst Brad phoned his girlfriend to arrange more nights of dancing and festivities. Leaving the church they made their way down the steps to view the giant Aysgarth Falls, but were sadly disappointed to find that they were just a trickle, due to the low rainfall over previous weeks. However, they were re-assured to know that today's rainfall would quickly return the falls to their usual glory. 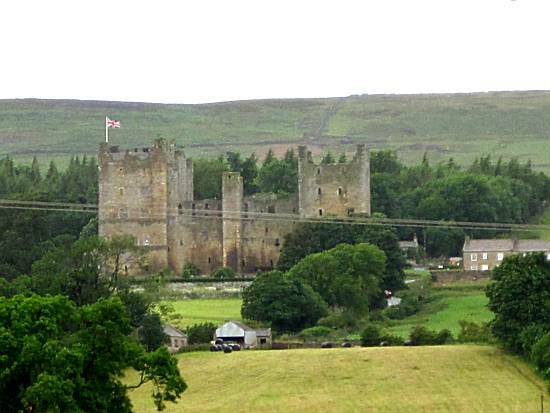 Cliff's ideas of heading into Carperby were rejected in favour of a more direct route, which provided good views of Bolton Castle. 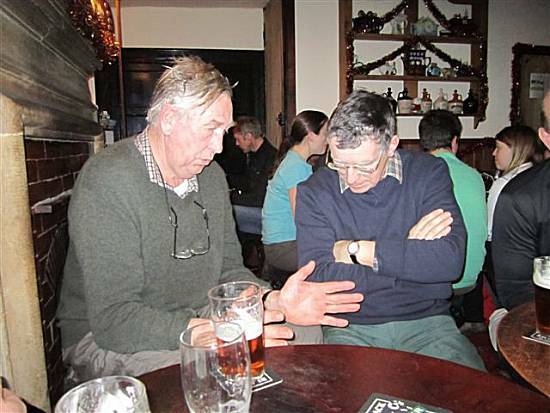 As the walkers headed into Redmire, they elected not to head for the Bolton Arms. A late morning stop enabled much of the pork pie and mars bar crispies to be consumed. The walkers ignored Brad who demolished a steel gate by leaning on it, but then chose to sit on it whilst enjoying his break. 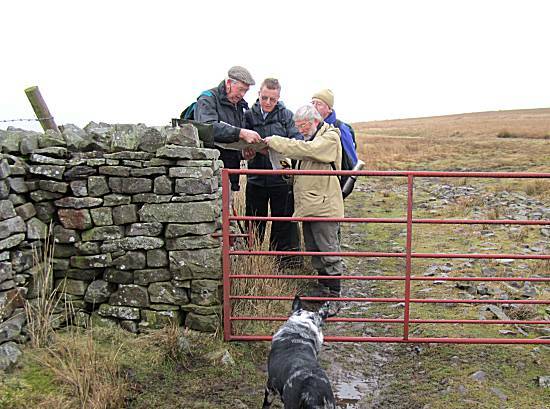 After re-erecting the gate the walkers continued onwards in the rain towards their planned lunchtime stop at the Three Horseshoes in Wensley. The walkers made up for their earlier lack of success in the bridge department with a splendid array. 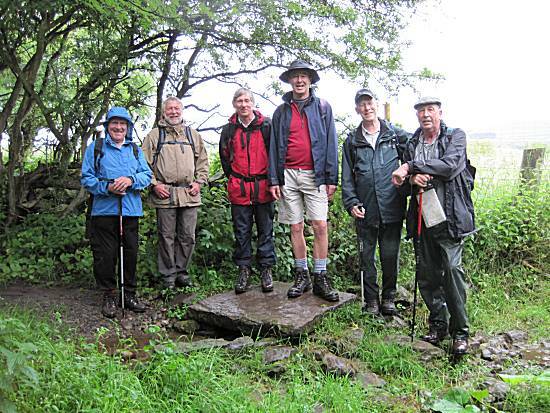 After walking past the mighty Bolton Hall, the walkers arrived in Wensley at the Three Horseshoes, as the rain continued to fall. Much merriment was made as the walkers started their long process of drying out, greatly enjoying the individual portions of fine chips served to them by the young waitress. 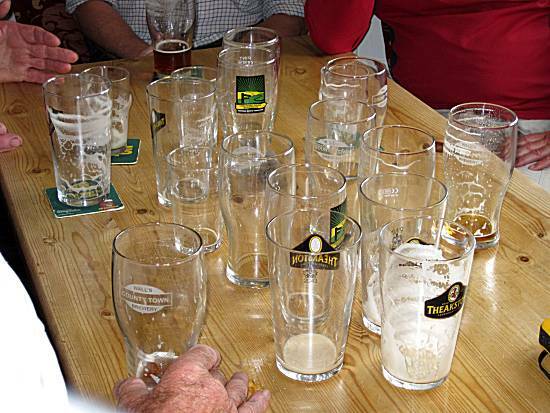 Much debris was left by the walkers after their extended drying period in the pub, when they were pleased to note that the rain had stopped, as they commenced the final stage of their walk. 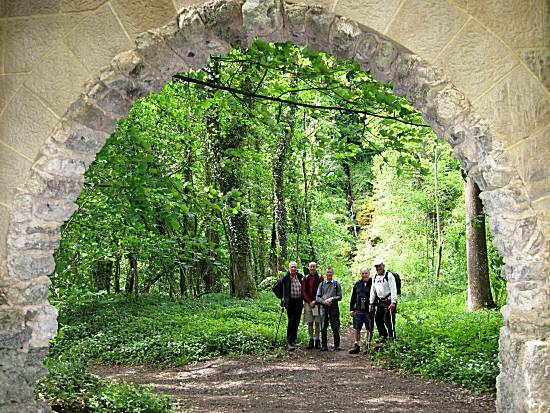 The walkers re-traced their footsteps back passed Bolton Hall, but made their way down to Lords Bridge, where they shared the last of their rations. Cliff took the walkers down a "permissive path" back towards Swinithwaite, which proved indistinct in places. 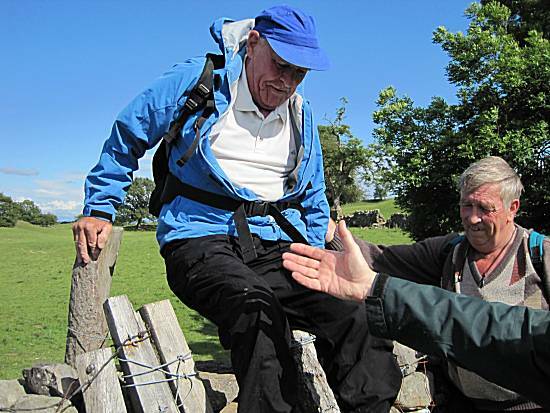 The walkers found it difficult to get Brad over a dry stone wall where the ladder on one side had collapsed. But Brad refused to give up and was successful. The walkers eventually arrived back at the car, where the Thoralby contingent were swiftly collected and returned to their homes. Weather: A very wet day, getting better in the late afternoon. 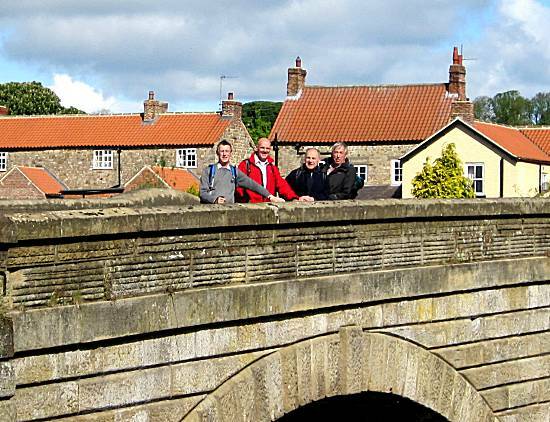 A depleted group of just four walkers met adjacent to the Navigation Inn in Ripon, enjoying nourishing Bacon and Sausage Butties courtesy of Ron, before commencing another long and difficult walk. Before setting off the walkers admired the intense activity in readiness for the Ripon Raft Race later that day. 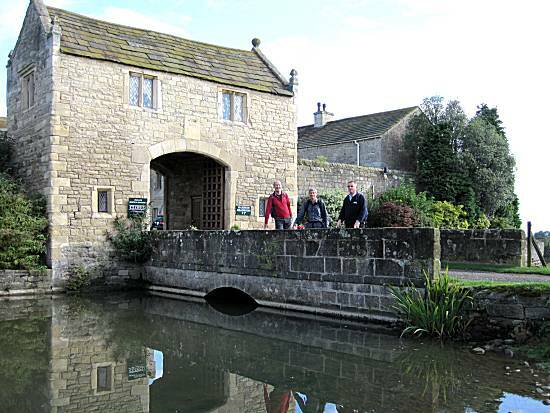 They departed Ripon following the River Skell towards Markenfield, where after taking a rather indirect route (disputed by the Leader), they stopped for a group photo outside the magnificent moated Markenfield Hall. Considerable indecision took place by Ingerthorpe before the route to Markington was agreed. Here they passed through the caravan and camping site heading onwards towards South Stainley. 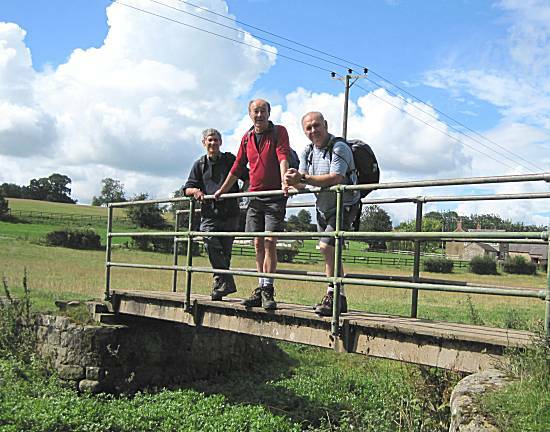 On arriving at South Stainley the walkers gathered on a small bridge to enjoy Pork Pie rations and share Alan's Mars Bar crispies. 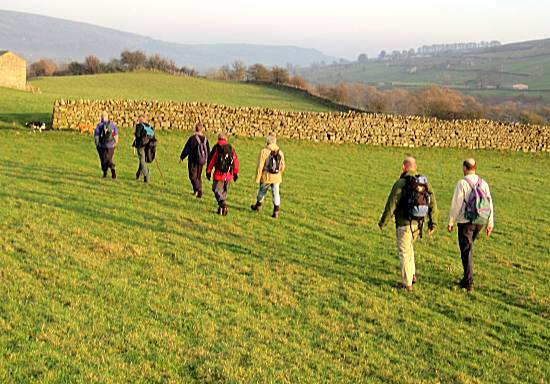 Due to their excellent progress, the walkers decided to extend their walk into Burton Leonard, so as to not arrive at the Hare & Hounds too early. On arrival they elected to take their excellent Timothy Tailors Landlord ale and shandies in the rear garden to maximise sunshine intake. 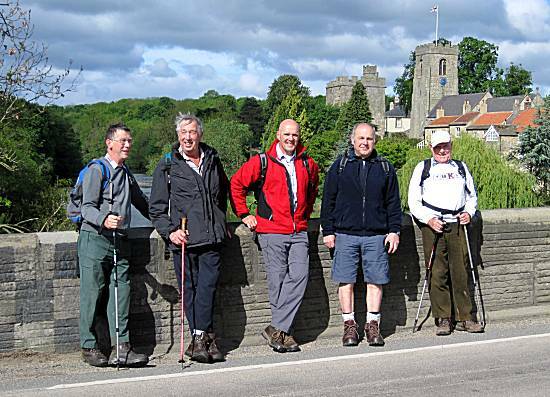 Responsibly, after only 2 pints, the walkers departed heading towards their next stop at Bishop Monkton. The walkers became concerned as they headed onward, observing giant black clouds and distant rumbling of thunder. 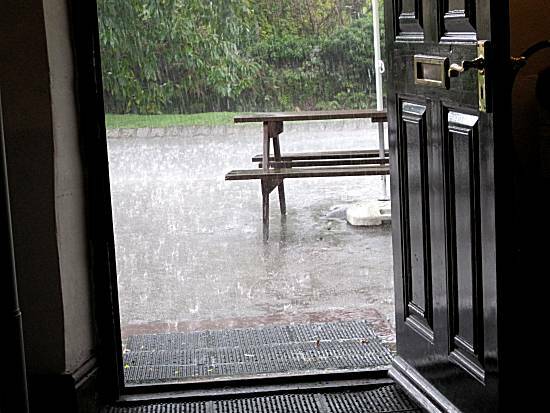 Would they make the safety of Bishop Monkton before they were drenched? The walkers just made the safety of the Mason Arms, before the heavens opened. Here they were compelled to partake in special rain preventing cheesy topped chips, whilst they watched the rain bouncing off the road. On leaving, in only light rain, the Ripon Rowel route then took them towards the River Ure, which was followed until the Ripon Canal started. 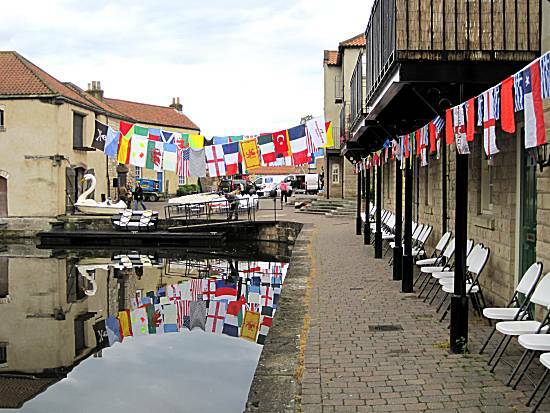 Several of the walkers closely observed and studied the locking systems, knowing that within 2 weeks they would be navigating a narrowboat along this section of the canal. They also looked out for boat diesel filling facilities for future reference, but were unable to locate any. 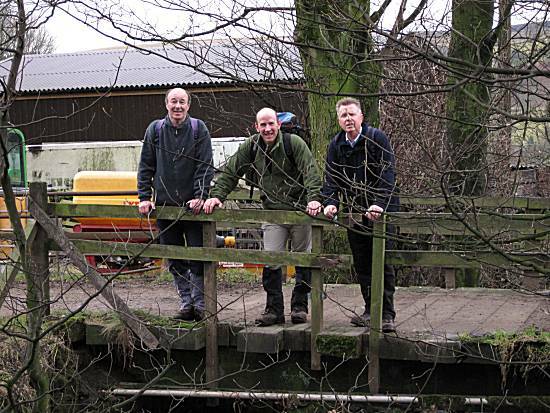 Arrival at the end of the canal indicated to the walkers the end of another enjoyable and successful walk. 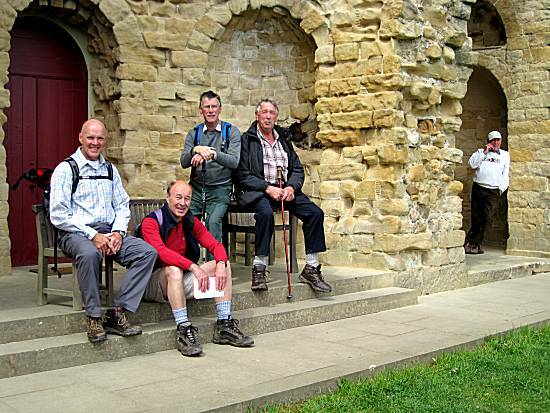 Walkers: Neil (Leader), Alan, Ron, & new Colin. Distance: 18miles with about 1,700ft of climbing - Pickering to Grosmont, via Goathland. 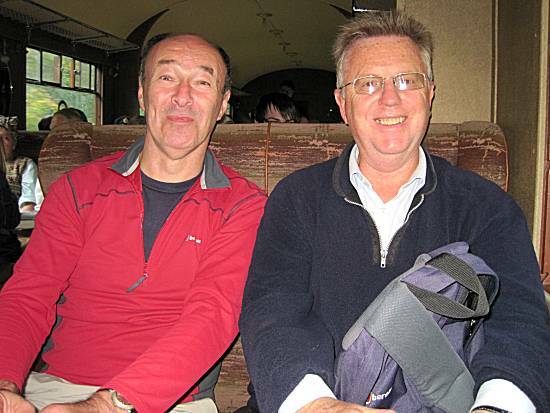 Lunch stop at "The Birch Hall Inn" Beck Hole, with a steam train back to Pickering. 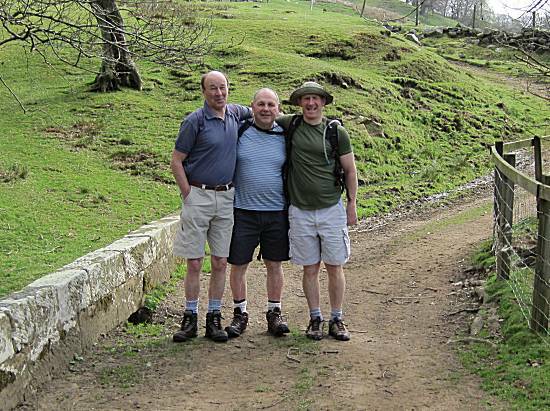 After a week of torrential rain, many of the regular walkers were insufficiently brave enough to attempt this difficult and testing walk and chose to stay with their loved ones, leaving just the intrepid trio Neil, Ron and Alan to tackle the walk. Ron had offered to drive the walkers to the start, arriving at an incredible hour of 8:20am, having enjoyed his nourishing bacon and sausage butties on-route. After finding a parking space in the usual residential road, they set off in good spirit in very cold conditions. They could see that Pickering was getting ready for a big event, but were unable to understand the reasons for the celebrations. 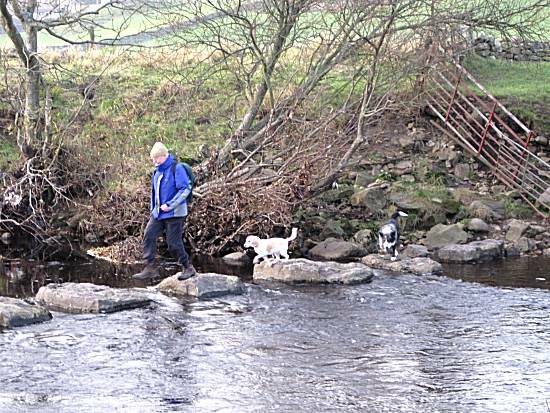 The first part of the walk was completed in record time, but Alan was dismayed to find that their usual Pooh Stick game was rigged, when his stick got trapped in an eddy and ended up just going round and round. Despite the recent rain, the footpaths through the woods were no muddier than usual. 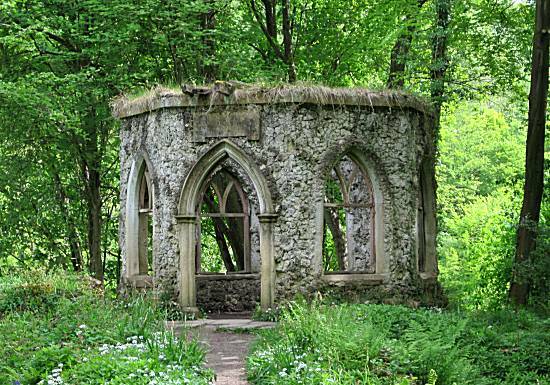 The walkers were amazed to find that a house had been built in their honour for them to shelter. However, they were disappointed to find that the roof was incomplete!! 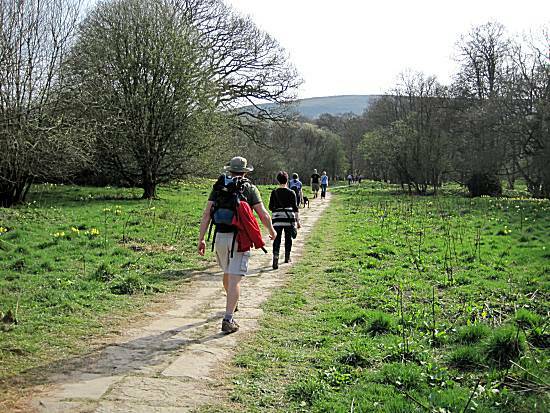 The sun shone on the walkers as they enjoyed their well earned sandwiches and mars bar crispies, whilst admiring the splendid views along Newtondale. The walkers were humbled to see that the locals had arranged for a steam train salute to be made in their honour. Before long and in the intense heat, the walkers became disoriented and could be seen standing in a trance, not knowing which way to walk!! Could this spell the end to their adventure? Will they have to call in the authorities? 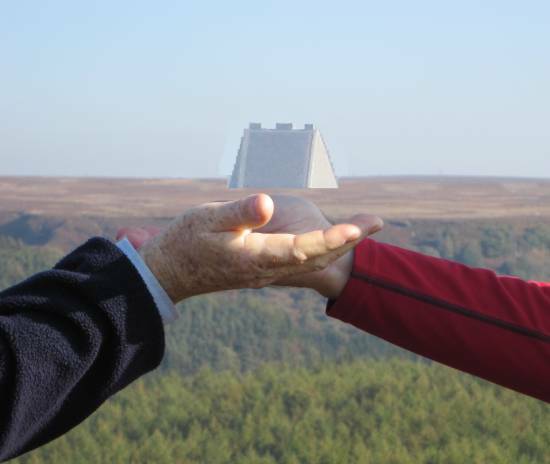 SAVED - On the horizon appeared a vision of a giant radar guidance system, which the walkers felt must have been constructed especially to guide their way to safety. Using the guidance signals from the system the walkers quickly and accurately located the route down to Newtondale Halt. Again with incredible skill, the walkers located a very steep but straight route up the side of the dale to the forest above where, with little rest, they continued on to Goathland Moor. Here they headed for the infamous Sheep Fold where they rested and shared their Pork Pie rations. 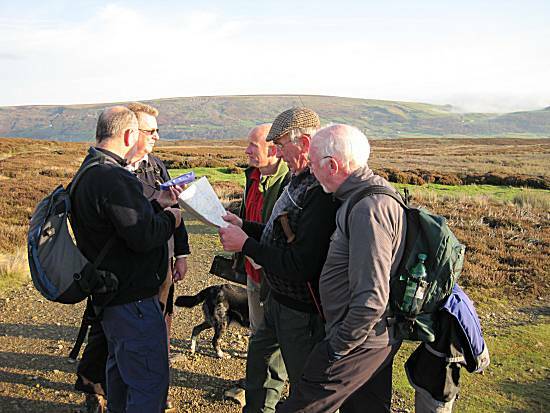 After a long transition of Goathland Moor, the walkers accurately navigated themselves to the giant markers, indicating that success was within their grasp. However they still knew that as September has passed, they were compelled to reach Beck Hole before closing at 3pm. 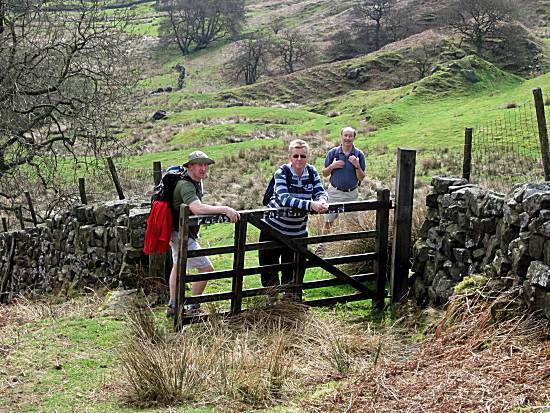 With much speed the walkers dropped down into Goathland desperate to locate the path to Beck Hole. Their determination showed as they pressed onwards towards their goal. 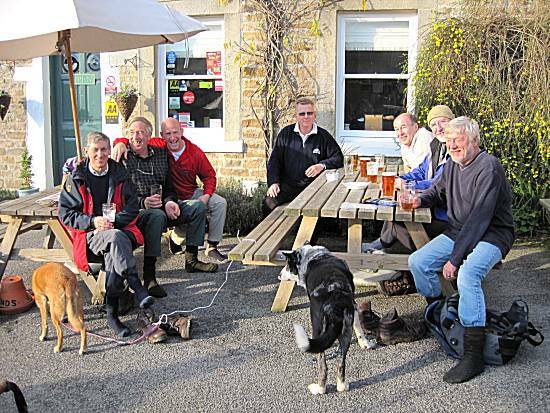 Much to the amazement of the locals the walkers arrived at Beck Hole at 2:05pm, where they enjoyed several pints of Black Sheep (except Ron). The local prepared portions of chips for the brave walkers of a quality that had never before been seen. 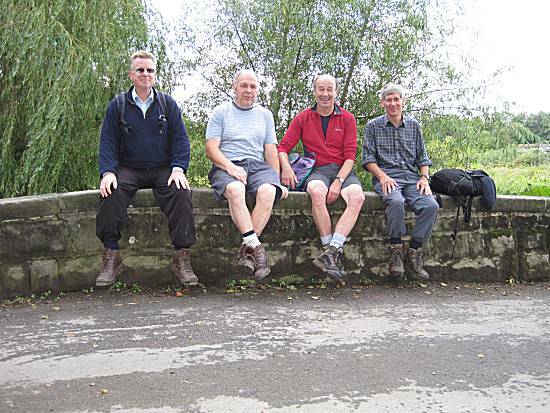 With characteristic skill the walkers accurately located a bridge and posed for a group photo, before continuing to Grosmont. Incredible scenes of celebration met the walkers as they arrived at Grosmont, with crowds of people, music and dancing. The walkers were pleased with their performance. A special steam train had been laid on to rapidly transport the walkers back to Pickering, where their obvious pleasure could not be hidden. 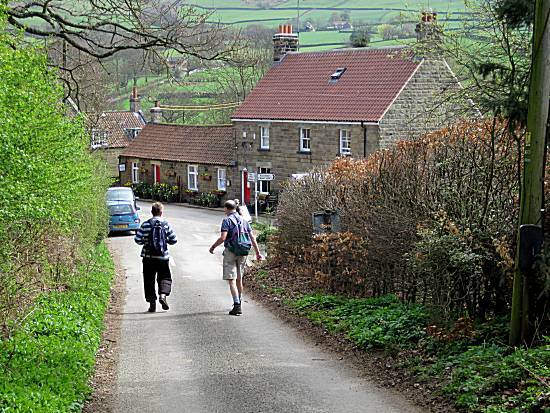 After arriving at Pickering, the walkers climbed the hill to the car where Ron swiftly transported the walkers back to their homes. Walkers: Neil, Alan & Ron. 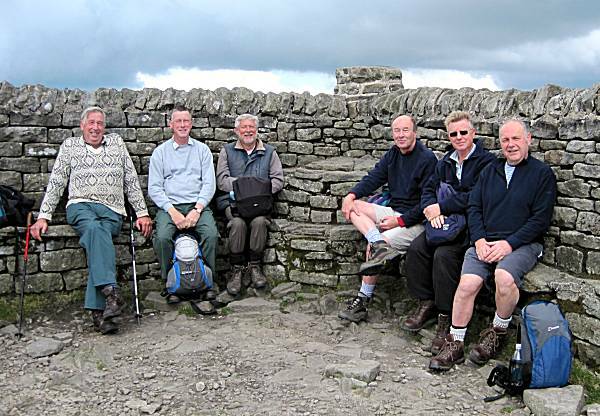 The eager group of walkers arrived on the cobbled market place at an early hour quick to consume Cliff's bacon butties, before setting off in high spirit towards Grinton Bridge, where passing the Bridge Inn they continued up the steep road to reach the moor. 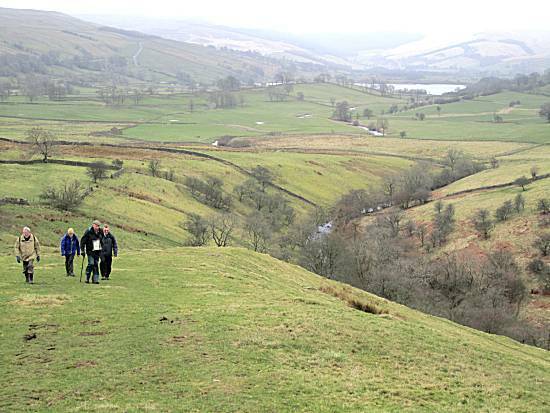 Although the path was indistinct they followed alongside the route of Grinton Gill and eventually found a good path continuing upwards, providing good views of Swaledale. 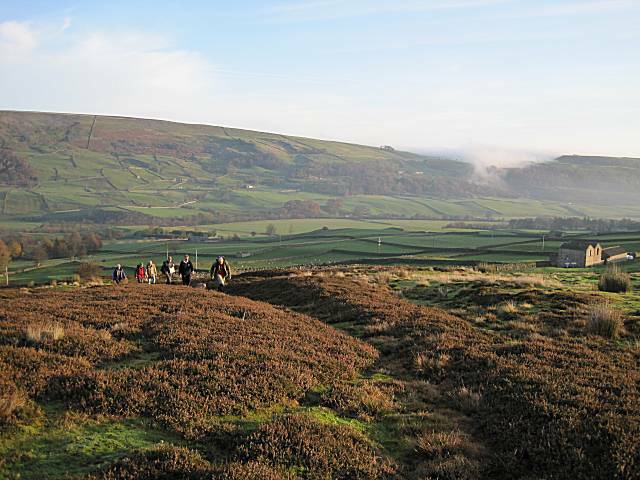 They marvelled at the mist sweeping over the side of the dale and pouring into the Dale. 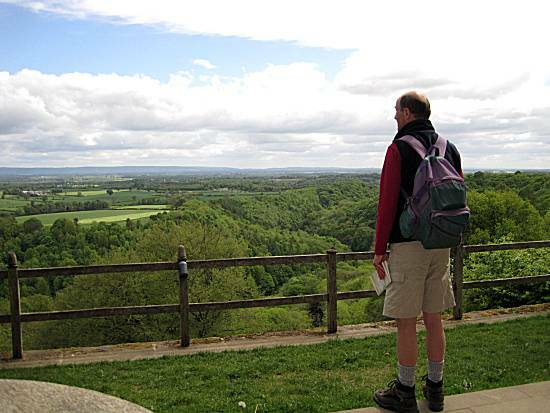 Progress became slow, as regular stops had to be made to allow Cliff to study the map, claiming that he had not walked this side of the dale before. The other walkers were suspicious of his actions. On reaching a high spot Cliff instructed the walkers to take a lesser defined and difficult route, which eventually re-joined the original route!! The walkers were kind to Cliff under the circumstances. Before exhaustion set in, the walkers quickly located a suitable stopping point to share their precious Pork Pie rations and some of Alan's Mars Bar crispies. 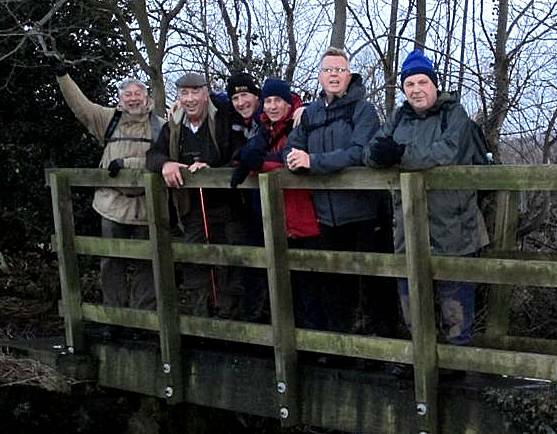 The walkers were greatly relieved to locate a bridge for their statutory group photo. With precise accuracy Ron used the GPS to locate the track down to the road. 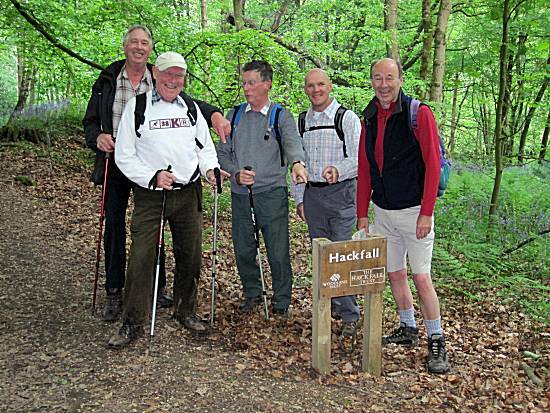 Due to the walkers incredible progress, Cliff instructed the walkers to turn left to add additional distance to the walk, as arrival at the planned lunchtime stop would have been too early. The route took the walkers down to cross the river at Isles Bridge, which was familiar to the walkers having started a walk nearby in April 2009. Ella was becoming anxious that the walkers might not find a pub for their lunchtime refreshment. However, with Ella's help, only a short distance lay between the walkers and the 'Punch Bowl' in Low Row, where the walkers settled outside in the warm conditions. 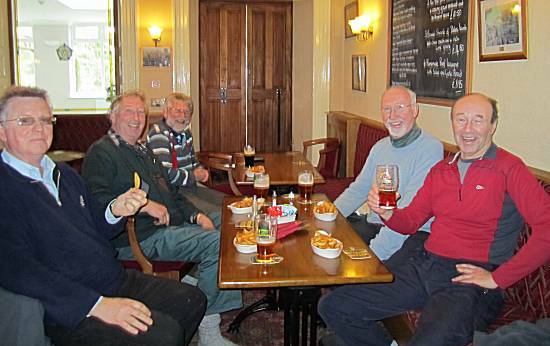 The walkers enjoyed pints of Timothy Taylors Landlord and were quick to negotiate a special deal of splendid chips and wedges, to their full approval. 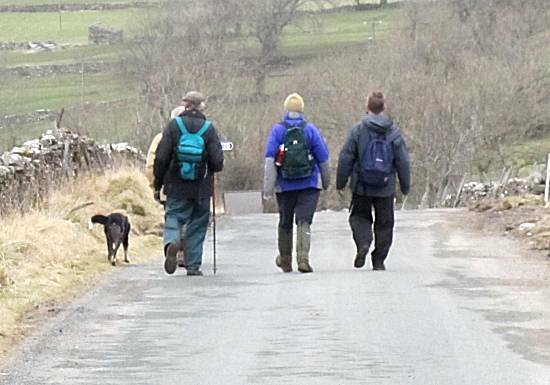 After leaving Low Row, the walkers followed the road through Feetham, before turning off towards Healaugh, where they responsibly walked in an orderly single file. 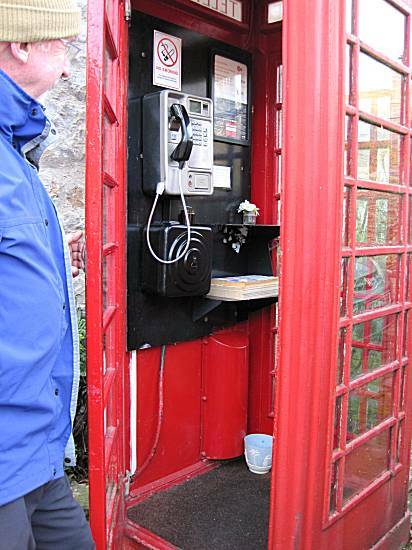 On arrival at Healaugh the walkers admired the clean carpeted telephone box, with fresh flowers and a waste bin. Leaving Healaugh the walkers headed down towards the river. Much to the surprise of Ella, Ron failed to tread solely on the stepping stones and ended up chest deep in the freezing cold water with an almighty splash!!! 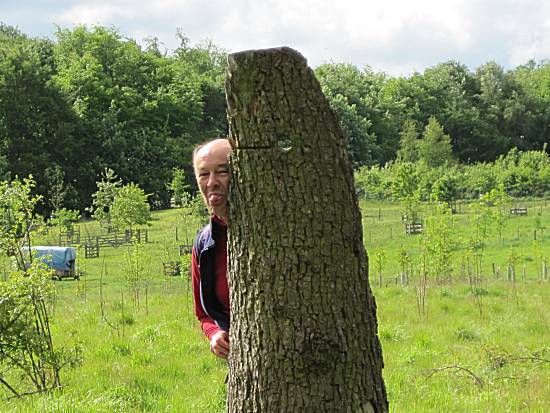 Ron received little sympathy from the other walkers!! 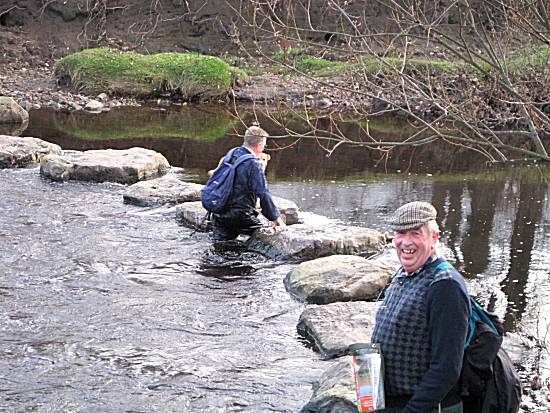 Tom decided to take the stepping stones at great speed, successfully negotiating the treacherous river crossing. 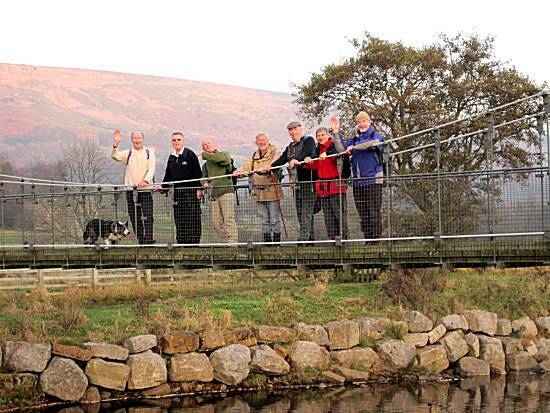 The route back to Reeth followed the river, crossing on the giant suspension bridge, where the walkers again posed for another group photo. 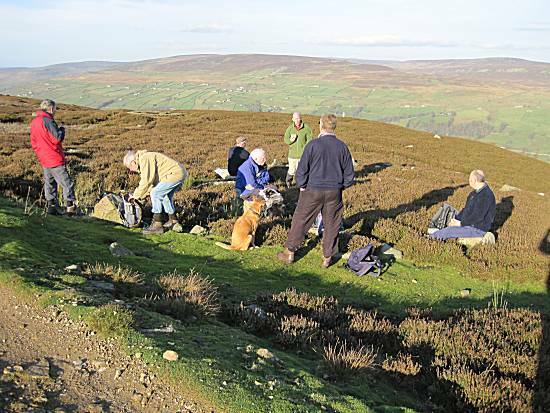 From here the route quickly took the walkers back to the very centre of Reeth where they were pleased to locate their cars, before daylight had failed. They quickly discussed their next walk, which all agreed would be the infamous Coverbridge Christmas Walk. 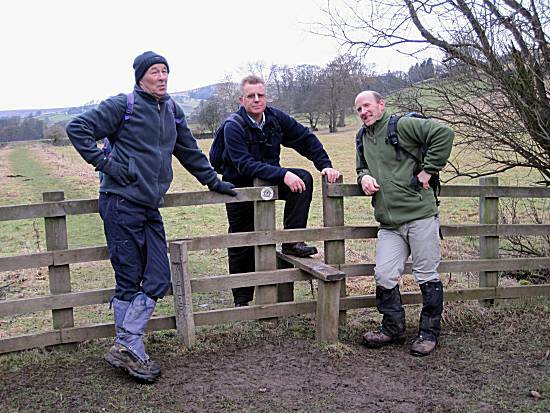 Neil and Alan were first to arrive at the familiar grass verge just south of Leyburn, but were soon joined by Sean and Ron at the start of a wet and very windy walk. The Thoralby contingent paused briefly, as they passed, explaining that they were dropping off the giant Christmas Pie at the pub. 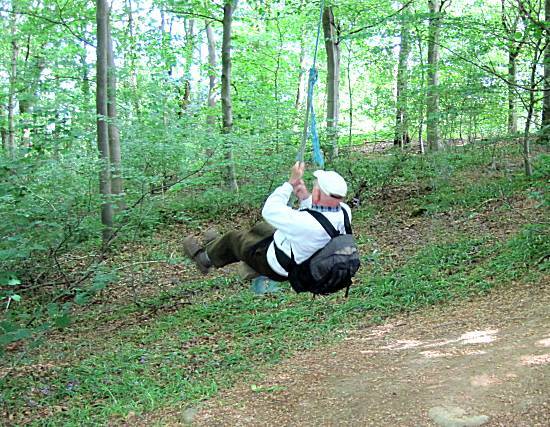 Ron was quick to share his bacon butties amongst the walkers, before setting off. DISASTER occurred almost immediately as Sean realised that he had forgotten his weatherproof jacket. 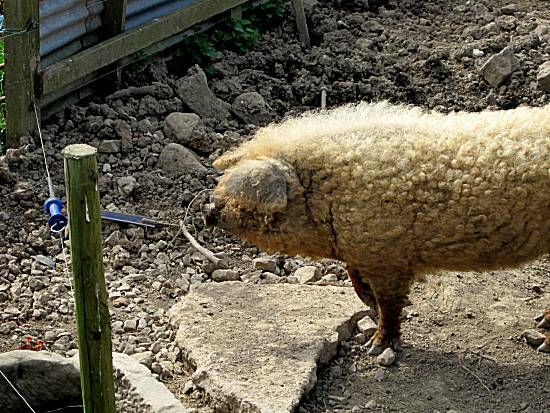 Gallantly Tom lent him a stripy woolly jumper, saving the day. 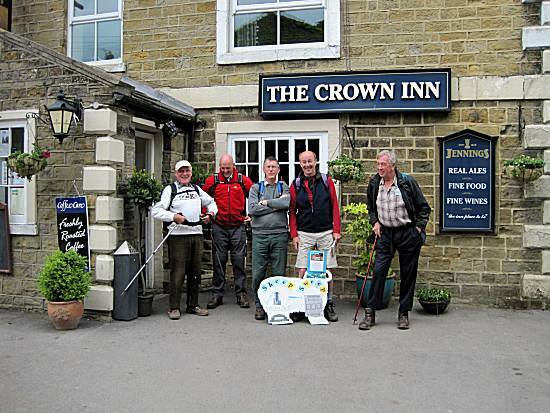 They set off in the very windy conditions, quickly passing through Leyburn before joining the "Leyburn Shawl" footpath. 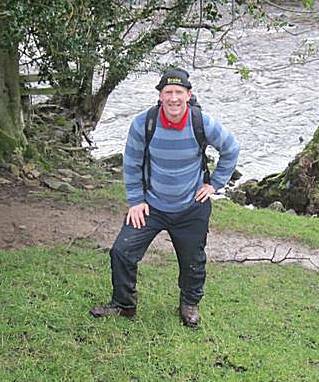 The walkers reached Preston under Scar in the terrible conditions before turning south towards Bolton Hall. 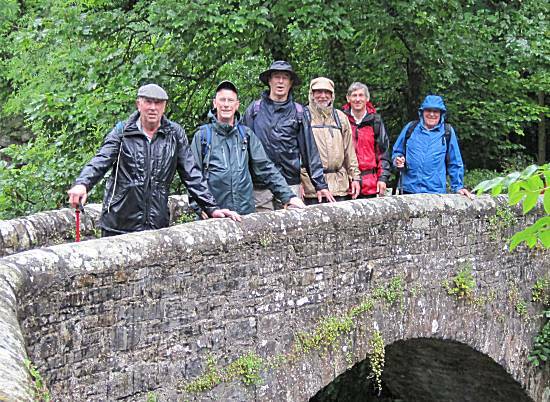 The walkers sheltered from the rain, just after crossing Lords Bridge, sharing their rations, including energy releasing Mars Bar Crispies. Paul joined the walk at this point stating some feeble excuse to missing the most difficult sections. As they continued they were faced with the climb to the Middleham Gallops. 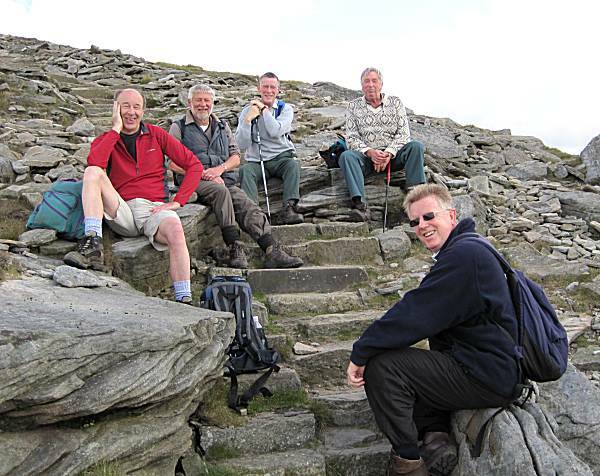 The walkers rapidly dismissed requests from certain members of the group to take the direct and steepest route up the bank and elected to take the usual more gentle path to the top. 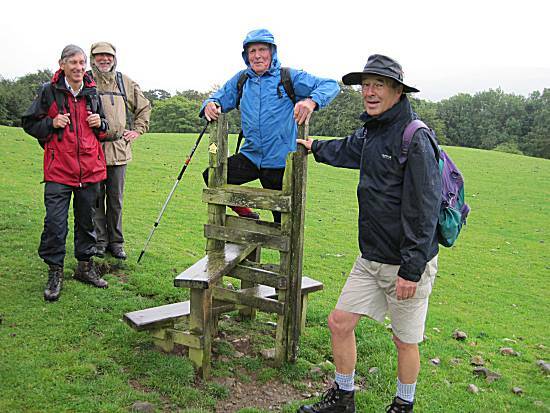 On reaching the open 'gallops' at the top, the walkers found the driving rain from behind almost impossible to bear and sheltered briefly before heading down past Middleham Castle. DISASTER OCCURED as Alan slipped and fell in the mud (twice) whilst negotiating the difficult route down the steep bank to the river. 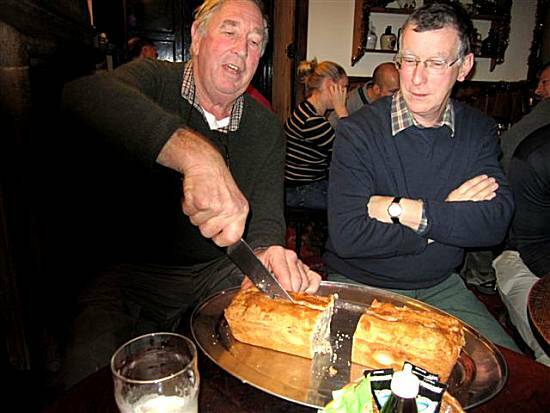 Paul sat in disbelief as Cliff indicates the size of his pie!! 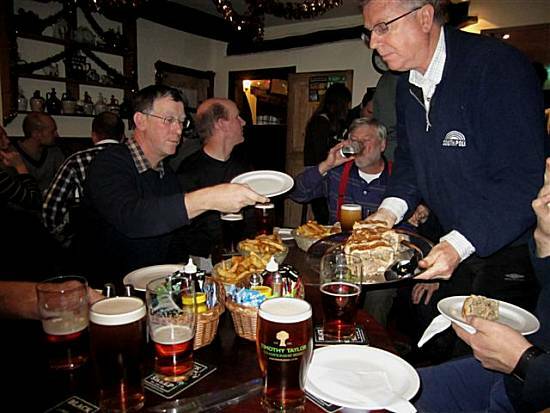 The walkers were pleased with their choice of Timothy Taylors Landlord ale, as they waited for the division of the giant Pork Pie, that was served with bowls of welcome chips. 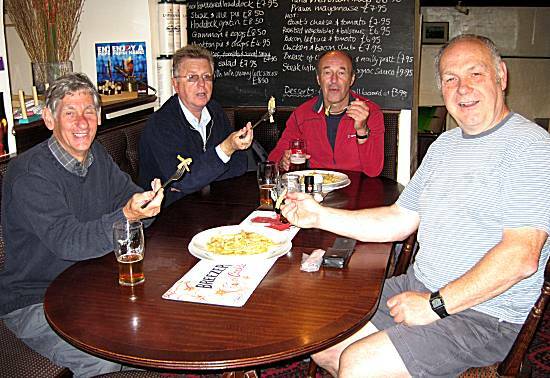 As it was Tom's birthday the previous day, he generously paid for the chips and a round of drinks, much to the appreciation of the walkers. On reaching Alan's car, transport was waiting for the Thoralby contingent, who were were swiftly transported back to their homes. 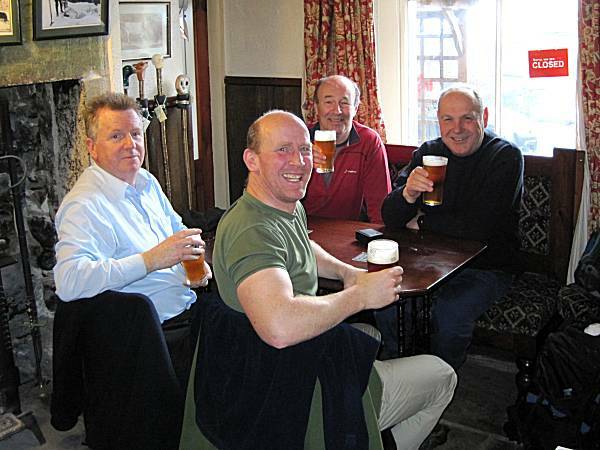 All agreed that this was a very successful end to the 2011 walking diary. 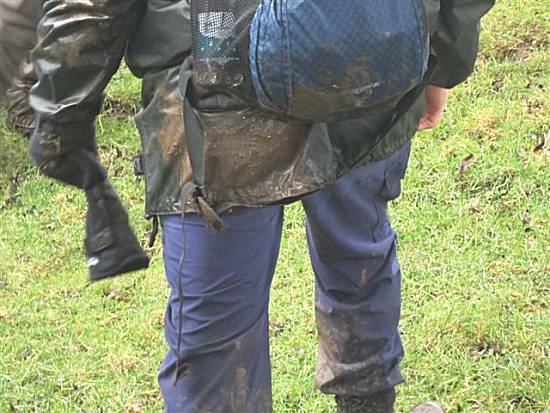 Weather: Wet, muddy and very windy for the entire route. 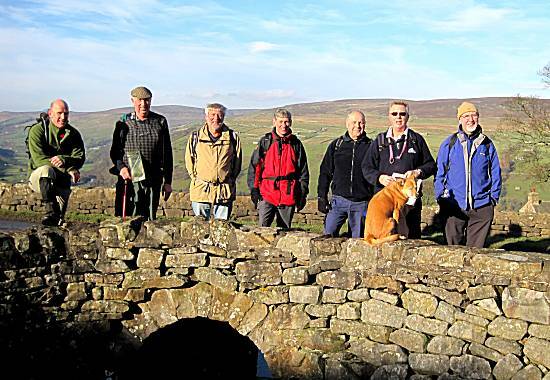 Walkers: Ron, Neil, Alan, Sean, Colin, Paul (Part Time), Andy, Cliff and Tom with Moss and Ella the dogs.